Santa Fe’s arroyos, which feed directly into the Santa Fe River and have been largely neglected, are filled with trash, and have been left to erode. Their soils, neighboring banks and channels, are slipping away, setting the scene for dangerous storm events and floods. They need rescuing – now – trash needs to be removed, and water needs to slow down on its way through – to protect the people and environment, and to help our precious water infiltrate and join the groundwater to replenish our vital aquifer. The impact of this work cannot be overestimated, especially as the climate becomes drier and hotter. Our watershed is life to Santa Fe, and together we can help the arroyos become what they should be. The Adopt-an-Arroyo program will strive to clean up the intrinsic and necessary drainages by removing litter and providing a safe place for people to recreate in and around. Additionally, any soil erosion reduction measures that can be implemented will reduce sedimentation and excessive flooding in the entire watershed. Importantly, the repeated presence of the volunteers can lead to an “Ownership” of the arroyo by the Steward Team, providing a real relationship with our arroyos and the Santa Fe River. Based upon the successful Adopt-the-River program, the Adopt-an-Arroyo program would designate a Steward Team of volunteers whose mission it is to monitor the health of arroyos in the Santa Fe River watershed, removing debris, and advising the SFWA as to potentially damaging situations within each arroyo. Coupled with the Steward Team is a Sponsor entity who contributes the funding to provide for the on-going management and potentially necessary restoration measures. The path to arroyo rescue success can be rocky and filled with quick sand at times. One year of funding won’t be enough to make a difference to the long-term health of our arroyos – we need a program that can sustain itself and be in it for the long haul. We at the Santa Fe Watershed Association are well equipped to deal with this challenge and overcome it. Our Adopt-the-River program is in its 15th year and sustains itself in large part thanks to Sponsors of the program that we have developed over the years, many of which have supported us since the program’s inception. 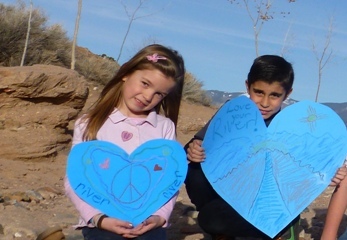 Adopt-the-River is well loved by all involved, and we will work to set up a similar support structure for Adopt an Arroyo within a year of our crowdfunding campaign. We understand that not everyone can contribute to causes with dollar amounts – there are so many other ways you can help! Make as much noise about our Arroyo Rescue as you can – share our campaign with all your friends and colleagues or become an Arroyo Steward! We will need dedicated Stewards to adopt Arroyo Reaches, and your contribution in time and work is the most valuable contribution of all. Get in touch with our Volunteer Coordinator to let us know you want to be part of our clean-up and restoration crew! Besides picking up trash at least 5 times per year, the Stewards report on any human activities, any dangerous utility situations, and any unusual erosion scenarios. There will be an initial training Session for all Steward Teams as well as regular “check-in’s” to monitor the morale of the team. In order to acknowledge the Steward Team, there will be a sign prominently posted along the reach of the arroyo acknowledging the Team’s commitment.